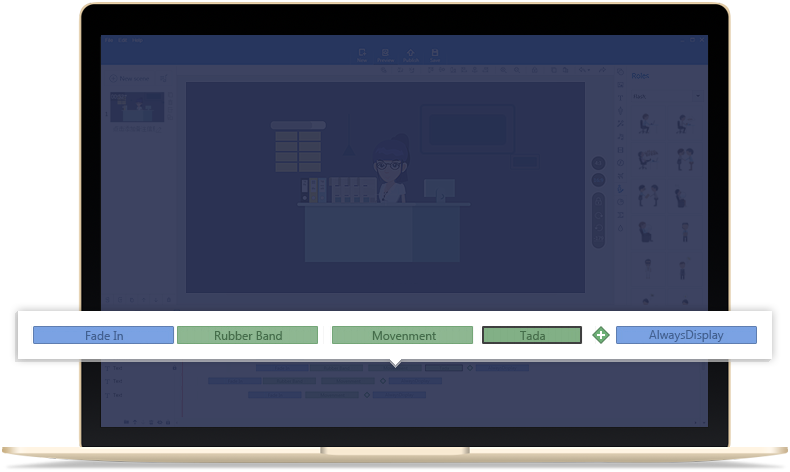 Utilize the simple but powerful timeline to customize background, caption, audio, animations and playing time of animated videos. Additionally, you can customize the time of scenes and fully control the video time exactly. 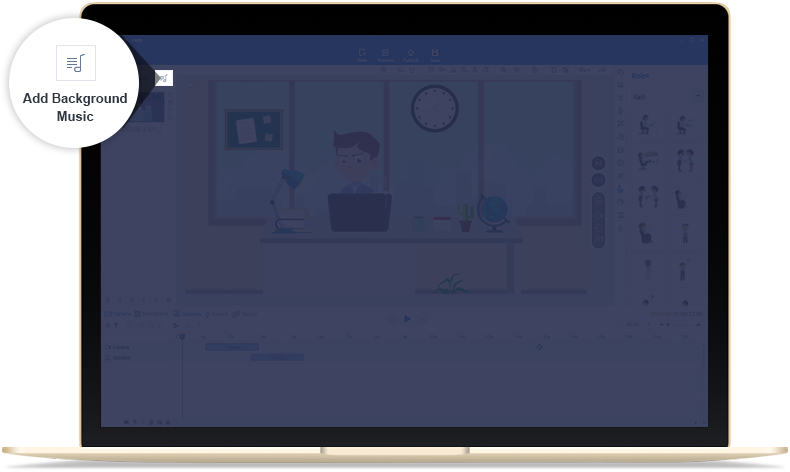 Simply to import your PowerPoint file (*pptx) and turn your linear PowerPoint presentation into animated video presentation in a breeze. Make full use of the camera of Animiz to make video interactive and go straight to your points quickly. You are able to amaze your audiences with the great zooming, panning and rotating camera effects. Fonts bring your words to life. With Animiz, you are able to enhance your common fonts with special WordArt or shadow effect. It is an effective way to make your animated video presentations more professional and attractive. Different shapes (arrows, rectangles, circles, dialogs, etc) can be used to design video presentation layout. You can find out the necessary shapes right away and fully customize their color, size and opacity. Animated videos with right background music will easily create a certain mood and resonate with your audiences. The perfect combination of music and video scenes can bring a new sense of hearing and visual enjoyment. Symbols in Animiz can be commonly used in nearly all situations. For one thing, you can customize their color, size and opacity. For another, it helps you to present your ideas one by one with those symbol icons. Charts speak louder than millions of words when giving your points. 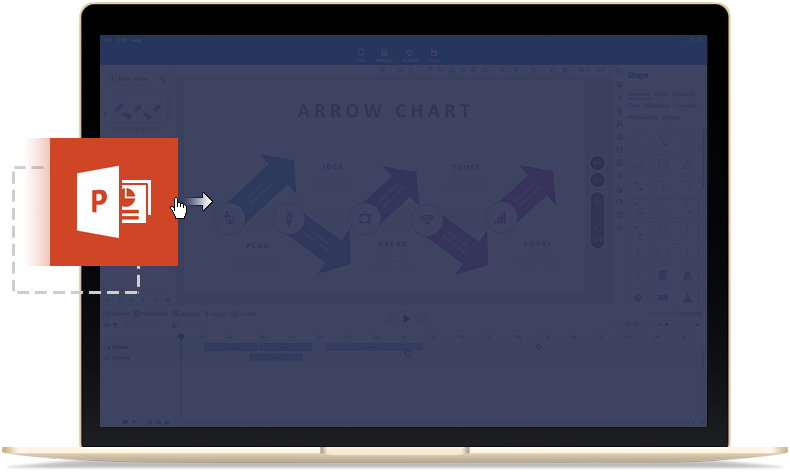 In Animiz, you can easily choose one of the chart templates (bar chart, dot chart, pie chart, stacking chart, etc) to customize your data and explain your points in a more persuasive way. 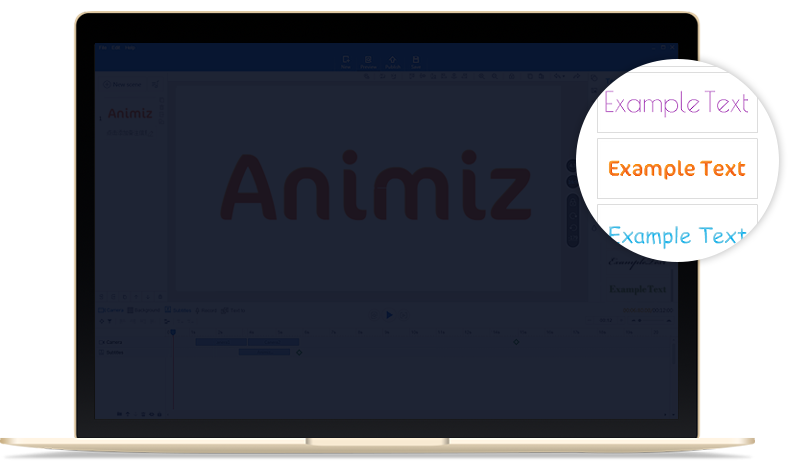 Animiz helps you to easily add and customize different mathematic formulas. It is absolutely a powerful tool to give your animated video presentation especially the statistic-based video presentation. When editing your animated video, you are able to emphasize or hide any part of your video presentations with four different label effects including blur effect, spotlight effect, mosaic effect and highlighter effect.